José Mourinho reacted today on Bo Larsen words (international referee who criticised Ronaldo a few days ago by saying he dived too much). The "Special One" said: "He’s an intelligent referee because intelligent people know how to get themselves into the spotlight. One of those ways is to criticise Cristiano and it appears that Larsen understood this. Cristiano Ronaldo is a top player, but the referee in question is very normal, no one will remember him when he retires." Mourinho also answered Daniel Alves statements. The brazilian defender said Mourinho didn't discover football and that he can't win every match when he just seats on the bench. 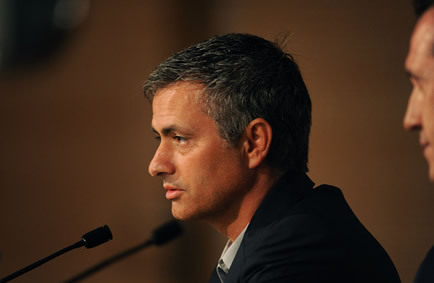 Mourinho used his famous irony to answer: "We all need to learn from smart people. Einstein wouldn't say it better than Daniel Alves. Brazil was discovered by a portuguese man, but it wasn't a portuguese who discovered football. He's completely right, I didn't invent the game of football." Real Madrid and Cristiano Ronaldo will play this sunday against Zaragoza in "La Romareda" stadium and you can watch the game live on www.ronaldo7.net (inside the live section). Clockdown timer on the top right corner of this page will show how much time is left untill the game starts.